You meet people who forget you. You forget people you meet. You meet people you can't forget. At the age of twenty-eight months, my granddaughter Sarah, laden with a pink backpack almost as big as she was, eagerly boarded the school bus to begin the early intervention program for children with developmental delays. Her class, for two-year-olds, merged for activities with the class for three-to-five-year-olds. There, Sarah met Connor. They were immediately drawn to one another. Both children have Down syndrome. They now attend different public schools, integrated into general education classrooms. Beginning with this year’s fall school term, Sarah is in Third Grade and Connor is in Fourth. 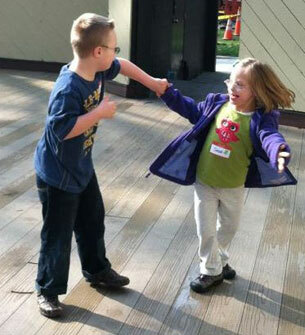 They each have many friends; typical children as well as those in their Special Ed classes. But for the most part, it’s Sarah and Connor—Connor and Sarah. When together, they walk hand-in-hand. On a chance encounter, they both gasp with surprise and fall into a hug. Aim a camera at them and they cuddle and smile. If they haven’t seen each other for a while, they beg their mothers to schedule a play date, a lunch outing, a movie, or bowling. When parting, they cry and hug and wave goodbye until the other is out of sight. Mention Down syndrome in conversation and chances are someone will comment that people with DS are very loving. While it’s true that many people with DS demonstrate a loving attitude and are extremely sociable, they experience the same wide range of emotions as anyone else. They do not all have identical personalities and they are not always happy. Like any other child, Sarah has a stubborn streak that tries everyone’s patience. She’s also charming, the embodiment of the saying: She never met a stranger. Born with a hole in her heart, which was repaired at three months, she has since embraced life with a steady beat and a joyful rhythm. The unofficial goodwill ambassador at school; students and teachers greet Sarah when she walks down the hall. She’s active in Brownie Scouts and proud of her badges. She enjoys swimming and diving, using her iPad, arts and crafts, listening to music, and dancing and singing, often to an imaginary audience. She loves reading and has her own library card. She dotes on her younger (bigger) brother and adores her older sister, mimicking her every move. Both Sarah and Connor are polite and sweet to everyone, but neither is as affectionate to other playmates as they are to one another. Theirs is a special friendship and love. No one who knows this pair will be surprised if they one day announce their engagement. Short of that, they are soul mates. Best friends forever.